It's been a fun run here at blogspot for this WJEA blog. Unfortunately, Blogger has outlived its usefulness, and we've now moved the blog onto our own server using the wordpress.org software. Check it out at http://wjea.net/blog. We hope to see you there early and often, and we hope you love the changes as much as we do! And if you want to find something we've written in the past, don't worry -- all of our posts from here appear over there, too. One of the main opponents of student free speech in the state of Washington, Everett School District superintendent Carol Whitehead, is retiring at the end of the summer -- four months ahead of schedule. The relocation of the journalism teachers at both Everett and Cascade to another school in the district. Whitehead said she decided to up the time frame of her retirement from January to September because of a recent threat on her life. I ran across a couple of stories on the First Amendment today that I thought might be of interest to you that I'm passing along. First comes this story from the Chicago Tribune, exploring the possibility that censorship is on the rise in the wake of the firing of a respected adviser in Naperville, Ill. Quoted in the story are former SPLC director Mark Goodman and current SPLC director Frank LoMonte. "Experts are adamant that losses like (adviser Linda Kane's) reverberate and are much more foreboding. The disagreement that led to Kane's dismissal stemmed from some controversial articles on drug use among students, and experts say her firing is part of a growing trend toward censorship in high schools, a trend that erodes citizenship, even chips away at democracy in important — if almost imperceptible — ways." That last statement rings especially true for those of who believe student journalism is at the cornerstone of teaching democracy to future citizens — both those who work on publications and those who read them — and is supported by this recent article from the First Amendment Center. "After 12 years of censorship and regimentation, many high school students will graduate this spring with little or no idea about what it means to be a free, active and engaged citizen in a democracy. "When they march across the stage to get their diploma, let’s hope someone slips them a copy of the First Amendment — with instructions on how to use it. "Far too many public school officials are afraid of freedom and avoid anything that looks like democracy. Under the heading of “safety and discipline,” administrators censor student religious and political speech, shut down student newspapers and limit student government to discussions about decorations at the prom. "Fortunately, a growing number of brave students defy the odds and take seriously what they hear about free speech in civics class." If you're hungry for more information on the Naperville issue, I suggest starting here, then going here and here. 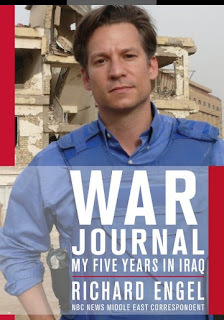 The Washington News Council is sponsoring a special presentation featuring Richard Engel, war correspondent for NBC News, on June 9 at 7 p.m. in The Seattle Times Auditorium and is inviting advisers and students to attend. The cost is $10, and only about 60 seats remain out of the 100 originally available. Tickets can be reserved by calling 206-262-9793 -- ask for WJEA President Kathy Schrier. The evening will be moderated by KING 5 anchorman Dennis Bounds, and is scheduled to last two hours. Every time it seems like the actions of the Everett School District can't get any weirder or more outrageous, Superintendent Carol Whitehead proves us wrong. It turns out that Whitehead's district viewed Kay Powers, the former journalism teacher at Cascade High School, enough of a threat that it set up video surveillance in her classroom -- without her knowledge -- to see if she was helping students produce an underground newspaper. For her part, Whitehead says she had no knowledge of the cameras when they were installed, but defends the district's actions as legal. The teachers union, of course, disagrees. Legal or illegal, the words "hostile" and "unsavory" jump to mind. DeMiero takes over the top spot after a distinguished 20-year career as adviser of The Hawkeye, in which he won numerous awards, including WJEA Adviser of the Year (twice) and the NSPA "Pioneer" award (the organization's highest recognition for advisers). He's stepping down as adviser of The Hawkeye at the end of this year, but will continue teaching at MTHS and will support new adviser Mark Isakson as adviser emeritus. Coyer (current secretary) and Fergueson-Holihan (current vice president) essentially flip roles, while Kalina takes over for Lu Flannery, who is stepping down after having been the WJEA treasurer for a very, very long time. Current president Kathy Schrier will move into both the past president role and the newly created WJEA executive director position. You can learn more about all of your new officers here. We've already talked here about the Newspaper Association of America study that suggests journalism kids do better academically than non-journalism students. The statistics are nice, but wouldn't it be really cool to put an article from an actual journalist who had determined the statistics to be valid in the hands of skeptical parents or administrators? Ken Robertson at the Tri-City Herald wrote a nice editorial touting the NAA findings and encouraging parents to put their kids in journalism programs if they really want their students to succeed. Feel free to use it liberally for promotion of your program. I know I will. If you attended the JEA/NSPA spring national convention about two weeks ago, you probably attended LA Times sports columnist Bill Plaschke's keynote speech on Saturday. And if you did, undoubtedly you walked away inspired and emboldened to carry out the mission of great journalism: To tell the stories of those around us. If you didn't attend the convention, or did but somehow missed the most amazing keynote I've heard in my nine conventions, or you just want to relive the speech again, there's good news: Text of his speech is available at this link. I plan on using it in my class every year from here on out. It captures everything that we should aspire to as journalists and journalism educators. I was a miracle. All because of my words. It was proof that words can take you place you will never imagine. That can be you. Be that miracle. Your words can make you one. That’s why journalism is still the greatest equalizing business in the world. It doesn’t matter your color or your gender or your bank account or where you live or how you talk. If you can write, you can touch, and if you can touch, we will hire you, because that’s one thing newspapers still do better than anyone else, we can touch and be touched, the morning paper soggy from the milk and the tears. Awesome. That's the only word I can think of.